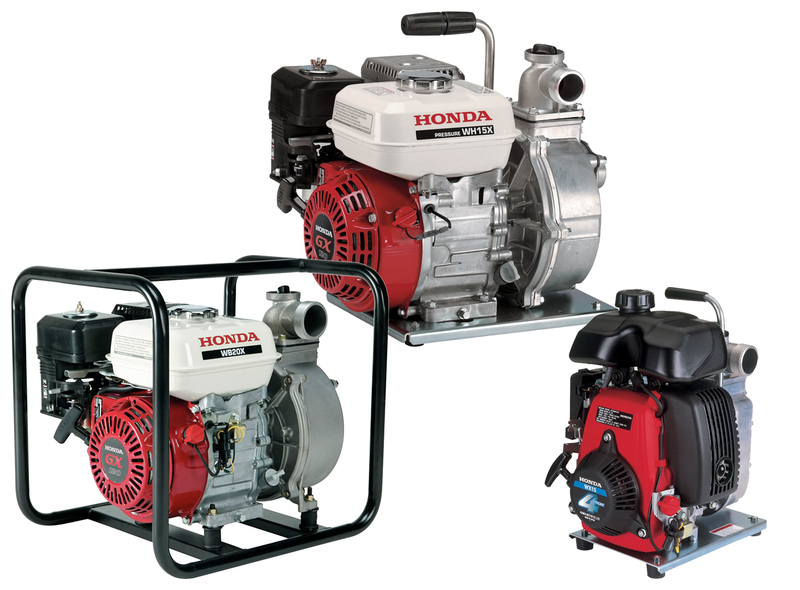 No two jobs are the same, so Honda builds a full line of water pumps to assist you with everything from garden irrigation and pool maintenance to heavy-duty drainage work on the job site. Whether it is a transfer, trash or high-pressure pump, Honda has a irrigation pump to meet your needs. At the heart of every Honda irrigation pump is a dependable, fuel-efficient, Honda 4-stroke engine, with our proven overhead-valve design to deliver more power and up to 25% better fuel efficiency over comparable side-valve engines. All Honda pumps use commercial-grade Honda GX series engines that run on gasoline and have large mufflers for quiet operation. Honda irrigation pumps adhere to the highest standards of quality in every aspect of their design. The WB and WH series pumps feature cast-iron cylinder sleeves and crankshafts supported by ball bearings for added durability in the engine, and cast-iron impellers and mechanical seats in the pump housing to ensure years of reliable service. The WB series pumps also feature full tubular steel frames and rugged rubber mounts for easy portability and added protection on the job site. Thanks to advanced features such as an automatic decompression system, maintenance-free electronic ignition and self-priming capabilities, Honda water pumps work for you, time after time. Honda’s Oil Alert™ is a safety system that shuts the pump engine down if oil drops below a safe operating level, preventing engine overheating and damage. Lightweight and portable, these light-duty pumps are designed for pool maintenance, filling water tanks at the cottage or small to mid-size drainage jobs. The WX10 can easily accommodate a standard garden hose (1") – (adapter included). These commercial-grade water pumps have extra-thick pump housings, full tubular steel frames and rugged anti-vibration mounts to withstand the rigors of the most demanding job sites. This series of high-pressure pumps are capable of displacing water at greater pressures for irrigation and spraying, or to higher discharge heights, even when used with long hoses.